'When the people saw that Moses was so long in coming down from the mountain, they gathered around Aaron and said, "Come, make us gods who will go before us. As for this fellow Moses who brought us up out of Egypt, we don't know what has happened to him." Like many people I have a borderline obsession with the amazing invention that is bubble wrap! Very little in life is as satisfying as popping the little bubbles and hearing that reassuring 'pop'. 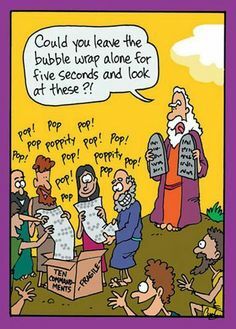 If someone brings me something wrapped in bubble wrap it will have to be something truly spectacular to take precedent over the popping of these bubbles. Does anybody else get distracted by packaging at the expense of a gift? I think many of us can easily fall into this trap... I worry if sometimes the Church has fallen into this trap. We sometimes can be guilty of putting ceremony and traditions ahead of the Gospel and our soul saving mission. This can be even worse at Christmas with the carol concerts, rehearsals for various events etc not to mention the present wrapping, Christmas card writing and all our other personal preparations; we can be so focused on these trappings that we can lose sight of the greatest gift of all, as the Israelites did when they lost sight of the LORD and instead became distracted by the Golden calf made by Aaron. No matter how shiny the packaging, the truth of Christ is that all of the extras in Christianity are unnecessary. All that matters is the Love and power of Christ and His care for us and His desire to welcome us into His kingdom. The extras can be great and beautiful and I'm not recommending a return to puritanism, but if these things: the concerts, the stained glass windows, coffee rotas and everything else we surround ourselves with, cause distraction and distance from God they must be removed...that aside though, enjoy them, let them add to our sense of wonder and togetherness...recognise their place but don't risk throwing out the bubble wrap with the bath water!